Hillary + Matt's wedding was breathtaking. Nestled in the mountains of Tuckasegee, NC is the Castle Ladyhawke. The exclusive venue was a destination choice for the couple, and it was truly remarkable. 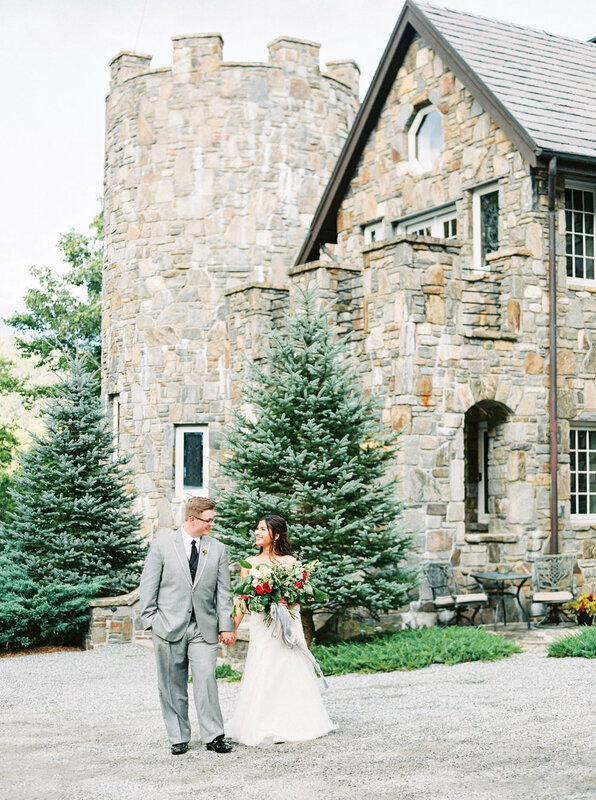 From the lush green rolling mountainside to the intricate stone structure, the setting was spectacular! I found myself on the giddy side at least a couple times during the day- not just because the couple was such a joy to be around, but because it was the kind of wedding day that we dream about. We, meaning planners AND couples. Perfect weather, picturesque landscape, elegant details, wonderful guests, fantastic vendors, ease of overall planning. Everything aligned perfectly for Hillary + Matt, and we were overjoyed to have been there to experience the magical day. After the first look, the couple privately conducted the foot-washing ceremony. It was a beautiful moment shared between them, as well as a beautiful photographic story! The couple hosted an intimate outdoor dinner with the prettiest of details. The smokey blue, soft pink and deep red color choices were a perfect pairing for the rich ambiance of the Castle. They contrasted beautifully, without overpowering the inherent beauty of the venue. As the sun set, everyone laughed and dined under the starlight. It was incredibly romantic and the perfect way to end the evening. You can find the Style Me Pretty feature HERE. Garden style florals in blush and red tones with a variety of natural greenery- including garden roses, traditional roses, spray rose and lots of yummy eucalyptus. Bridesmaids carried greenery bouquets with berry accents. Each bouquet was tied with dreamy ribbon in gold and blue. Farmhouse chairs in the same color as the castle's stonework added great texture and dimension to the tablescape. The blue linen is called Wedgewood . And it's one of my go-to blues. It goes with practically everything! Be sure to check back in a few short weeks for more of our favorite photos of the day (we're holding on to them for an extra special announcement)"